Marks Dimensions 23 in. x 11 1/2 in. x 4 1/2 in. This I think will end up being the best soaker in the 2004 lineup that's new. In 10-15 short pumps, this thing was firing to about 25-30 feet. Doesn't have the best of tanks, but holds an OK amount of water. Nozzle isn't great, try drilling a bigger one. The mini-soaker attached is a little--touchy--as you need to lay down the soaker, hold the valve with one hand, lean on the soaker, and pump with the other hand. It would've been better if they made it stay open, and not auto retract. When I did get it to work, it fired with the true power of a Super Soaker, extending a large blast about 20 feet...for 2 seconds. Now, on to the Soaker Attack Ball. It's a sponge, that when you pull a valve is dampened. Getting it in and out of the holder is a little hard on the move , so don't expect being able to take it out and peg a guy chasing you in the face. Also, the new "Quick fill cap" Although I see how it SHOULD work, it does squat except make you wet trying to fill it like that for the first time. However, overall, the 3A is a pretty good soaker. It's large but not in charge. 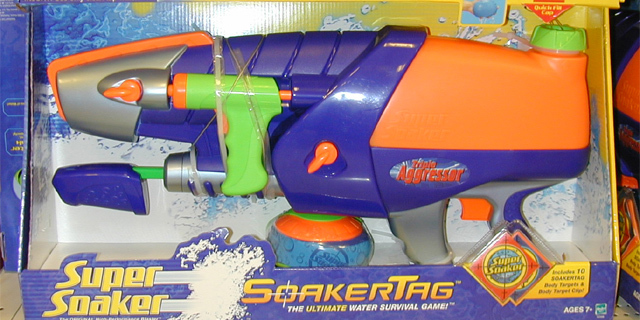 The Triple Aggressor is the largest gun in 2004's SoakerTag line, approaching the CPS 1000 in size yet lacking any of the associated power. Its pressure chamber is completely internal; no parts of it can be seen from the outside. The Triple Aggressor also lacks a strap--a major problem for a gun its size. The squirt gun and "soaker attack ball" are at best gimmicks. The reservoir, however, it large enough to power this blaster for extended periods. What it lacks in power, it makes up in capacity. For a basic blaster, it's not bad.